Dr. Isabella Karle (born Isabella Helen Lugoski on December 2, 1921) is an American scientist who was instrumental in developing techniques to extract plutonium chloride from a mixture containing plutonium oxide. For her scientific work, Karle has received the Garvan–Olin Medal, Gregori Aminoff Prize, Bower Award, National Medal of Science, and the Navy Distinguished Civilian Service Award (which is the Navy's highest form of recognition to civilian employees). Isabella Helen Lugoski was born in Detroit, Michigan, USA, on December 2, 1921, the daughter of immigrants from Poland, she attended the local public schools. While at school, a female chemistry teacher led her to her pursuit of the field as a career. She attended the University of Michigan on full scholarship, where she majored in physical chemistry and received a Bachelor of Science at age 19, followed by Master of Science and Ph.D. degrees in the field. Karle worked on the Manhattan Project during World War II, where she developed techniques to extract plutonium chloride from a mixture containing plutonium oxide. She joined the United States Naval Research Laboratory after the end of the war. Karle advanced the practical uses of the work her husband, Nobel Prize winner Jerome Karle, did on using X-ray scattering techniques to directly determine the structure of crystals, a technique that is used to study the biological, chemical, metallurgical and physical characteristics, allowing processes to be designed to duplicate the molecules being studied. This technique has played a major role in the development of new pharmaceutical products and other synthesized materials. She was elected a Fellow of the American Academy of Arts and Sciences in 1993. 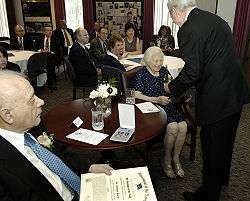 On July 31, 2009, she and her husband retired from the Naval Research Laboratory, after a combined 127 years of service to the United States Government, with Karle joining the NRL in 1946, two years after her husband. Retirement ceremonies for the Karles were attended by United States Secretary of the Navy Ray Mabus, who presented the couple with the Department of the Navy Distinguished Civilian Service Award, the Navy's highest form of recognition to civilian employees. Madeleine Karle (1955) is a museum specialist with expertise in the field of geology. ↑ Staff. " profile", Journal of Chemical Education. Accessed September 22, 2009. 1 2 3 4 McKinney, Donna. "Jerome and Isabella Karle Retire from NRL Following Six Decades of Scientific Exploration", United States Naval Research Laboratory press release dated July 21, 2009. Accessed September 22, 2009. ↑ "Book of Members, 1780–2010: Chapter K" (PDF). American Academy of Arts and Sciences. Retrieved July 29, 2014. ↑ Jerome Karle: The Nobel Prize in Chemistry 1985, Nobel Prize. Accessed September 22, 2009. Massa, Antonia (2013). "Isabella Karle's Curious Crystal Method". Narratively: Human stories, boldly told. Retrieved 2013-12-05.